The optical component maker's recent roller-coaster ride is tightly intertwined with sector rival Finisar. 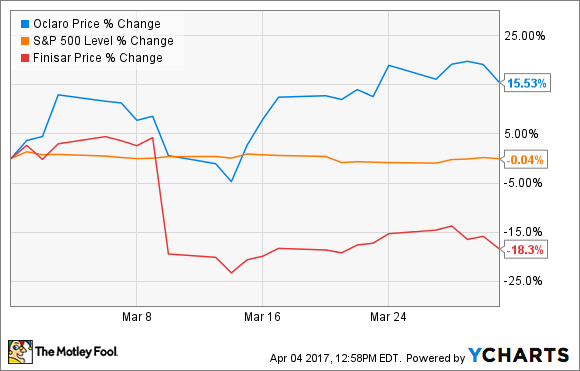 Shares of Oclaro (NASDAQ:OCLR) gained 15.5% in March 2017, according to data from S&P Global Market Intelligence. The maker of optical networking components was off to a good start in March, but it lost all momentum when rival Finisar (NASDAQ:FNSR) reported weak earnings with mellow management comments on the state of the optical market. Finisar shares plunged 23% lower the next day, dragging Oclaro down in a 13% three-day slide. But Oclaro bounced hard off the bottom of that trough as analysts picked apart Finisar's earnings call to find evidence that the company might be considering a strategic acquisition. Finisar's purported buyout target? Oclaro, of course. Specifically, Finisar CEO Jerry Rawls stated that "consolidation in general is good." Then he mused on what to do with his company's large cash reserves. Oclary would make sense as a target, being about half the size of Finisar and wielding a significantly different customer list. Later, Oclaro CEO Greg Dougherty agreed that industry consolidation would be "healthy" at this point. So, both sides of the rumored pairing seem open to the idea of getting together. So far, no actual buyout bid has occurred, and the surge may very well fade out into nothing. But don't cry for Finisar and Oclaro investors -- the stocks have gained 47% and 76%, respectively, over the last 52 weeks.